THE group opposed to the Occupy Central (佔領中環) campaign says it will not name and shame schools where class boycotts take place but only those that organise such boycotts. This comes after the Alliance for Peace and Democracy (保普選反佔中大聯盟) set up a hotline for class 'whistle-blowers' and for the public to report on high schools joining the boycott. It was accused of spreading 'white terror'. Students, however, seem undeterred as last Tuesday up to six Facebook pages were dedicated to claims that pupils from 76 secondary schools will be joining the boycott. They included the elite Diocesan (拔萃) Boys' and Girls' schools and Heep Yunn School (協恩中學). Students from at least 14 universities and colleges earlier announced a weeklong boycott of classes from 22 September in protest at Beijing's (北京) reform framework for the 2017 chief executive election. The alliance said its hotline will let people report on class boycotts in secondary schools, whose names may be made public if multiple verified reports are received. Following a storm of criticism, the group issued a statement clarifying its intentions. It said the alliance will not name the schools if the boycott action is joined by individual students. But if the boycott is an organised event, the group will report to the school, its parent-teacher association and the Education Bureau (教育局). Schools will be named only if they actually organise the class boycott. A bureau spokesman said it is "opposed to any kind of boycott that hinders staff from teaching and students from learning". Agnes Chow Ting (周庭), spokeswoman of student activist group Scholarism (學民思潮), voiced surprise at the number of students wanting to join the planned boycott, despite pressure from familes and schools. "If only a few hundred students join the strike, that will already be a very good result," Chow said. 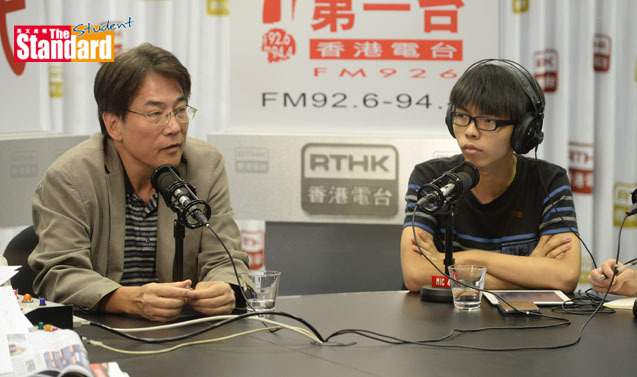 But Hong Kong Federation of Education Workers (香港教育工作者聯會) president and alliance member Wong Kwan-yu (黃均瑜) likened activists encouraging secondary students to boycott class to triads. The activists have openly threatened to step up their action if the boycott does not achieve its goals, Wong told a phone-in programme.